Until 30 or 40 years ago, almost all roof tiles installed in the United States were clay tiles, like those used for thousands of years in Europe and China. In the past few decades, though, concrete roofing tiles have edged out clay on residential roofs and now dominate the market. Roof tiles, whether concrete or clay, are very resistant to fire. Although some traditionalists prefer clay tiles over concrete, there is no arguing with the main advantage of concrete tiles: They cost about half as much as clay (see "Concrete Tile vs. Clay Tiles," below). Standard-weight concrete roof tiles generally weigh between 9 1/2 and 12 pounds per square foot — significantly more than asphalt shingles, which weigh only 2 1/2 to 4 pounds per square foot. For houses where weight is a concern, many tile manufacturers offer lightweight roof tiles weighing 5 1/2 to 7 pounds per square foot. These tiles are made with a lightweight aggregate, like expanded shale, instead of sand. If you're reroofing a house with existing asphalt shingles and you're not sure whether the roof structure is adequate to support concrete tiles, you should have the roof framing checked by an engineer before proceeding. Tile Types	Concrete roof tiles are available in three basic profiles: mission S-tiles (or "Spanish S"), villa tiles (low-profile tiles with a double-S shape), and flat tiles, which are often designed to look like wood shakes or slates. 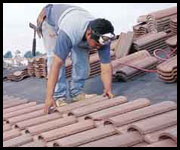 The job shown in this article used 17-inch-long Spanish S-tiles made by Eagle Roofing Products (see "Sources of Supply," page 4 of article). These S-tiles lock together along the sides, where they form a lap joint. Tile manufacturers provide trim tiles specifically designed to complement their various tile profiles. Most roofs will require at least two different types of tile: standard field tiles and ridge tiles. For jobs using S-tiles, we trim the ridges, hips, and rakes with a simple barrel trim tile. Some styles of roof tile use a rake trim tile that differs from the ridge tiles. Some manufacturers also offer a "hip starter" tile, a trim tile designed to be installed as the bottom tile on a hip. Low-slope installations. In general, the minimum slope for a tile roof is 3/12. If a customer insists on installing roof tiles on a roof with a pitch below 3/12, consult the tile manufacturer for installation specifications. Low-slope applications will require a carefully detailed waterproof membrane (for example, a self-sticking bituminous membrane) under the tiles. In addition, many tile manufacturers require that tiles on a low-slope roof be installed using a method that minimizes the number of fasteners that penetrate the membrane.